Shares have fallen moderately in Asia after the latest torrent of selling on Wall Street. Japan's Nikkei 225 index sank sharply on the open Thursday but leveled off, regaining some lost ground. By mid-morning it was down 2.9 percent at 21,443.72. The Shanghai Composite index slipped 1.6 percent to 2,561.36 and Hong Kong's Hang Seng index skidded 1.8 percent to 24,785.68. High-flying companies like Netflix and Amazon took some of the biggest losses Wednesday. Netflix gave back 9.4 percent and Amazon dropped 5.9 percent. Several companies sustained heavy drops after reporting disappointing results. Texas Instruments, a major chipmaker, slumped 8.2 percent and AT&T fell 8.1 percent. The technology-heavy Nasdaq composite is now 12.3 percent below its August peak. The S&P 500 index fell 84 points, or 3.1 percent, to 2,656. The Dow fell 608 points, or 2.4 percent, to 24,583. The Nasdaq composite gave up 329 points, or 4.4 percent, to 7,108. Texas Instruments, a major chipmaker, slumped 3.6 percent after its results missed forecasts. UPS fell 3 percent. Technology and media and communications companies also fell. AT&T dropped 6.2 percent. Boeing jumped 3.3 percent after beating analysts' earnings forecasts. The S&P 500 index fell 16 points, or 0.6 percent, to 2,724. 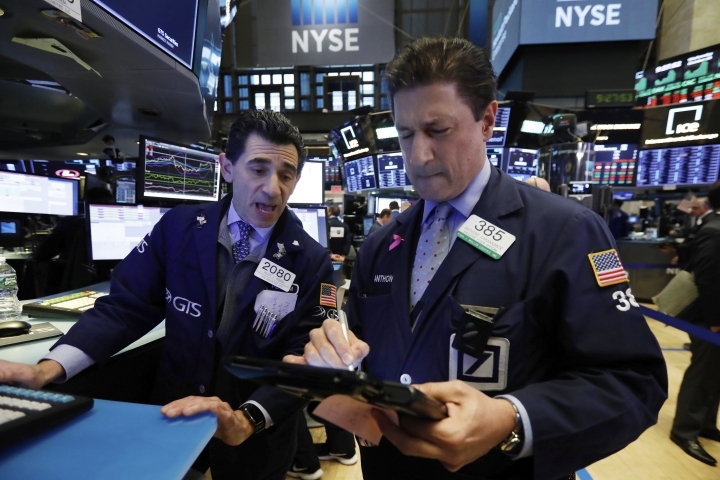 The Dow Jones Industrial Average fell 50 points, or 0.2 percent, to 25,138. The Nasdaq composite gave up 75 points, or 1 percent, to 7,362. Boeing jumped 2.2 percent in early trading Wednesday after beating analysts' earnings forecasts and raising its estimates for the year, citing faster orders for aircraft. Texas Instruments, a major chipmaker, slumped 5.5 percent after its results missed forecasts. The S&P 500 index fell 4 points, or 0.2 percent, to 2,736. The Dow Jones Industrial Average was higher thanks to the gain in Boeing. The 30-stock index rose 71 points, or 0.3 percent, to 25,259. The Nasdaq composite gave up 9 points, or 0.1 percent, to 7,427.